When inmates arrived in Amache they had practically nothing but the clothes on their backs. The barrack rooms were devoid of furniture or curtains, and with no stores in the camp, they inmates were confronted with major problems. They resorted to purchasing needed supplies through Sears and Montgomery Ward mail order catalogs. A second source of purchasing materials was through stores in Lamar and Granada. The truck that delivered mail from Lamar was used by some of the inmates to go purchase such essentials as nails, hammers, saws, and other materials to build furniture, bunk beds, separation walls, curtains and bedspreads. A small canteen was started and sold goods such as candy and cigarettes, ice cream, newspapers and magazines, and grooming essentials such as hand razors, soap and toothpaste. In 1943 a consumer cooperative was started and housed in a U-shaped building of three barracks built by the inmates in Block 9F. The barrack buildings were converted into small store sections that housed a shoe repair shop, a watch repair shop, dry clean and press shop, optometry shop, beauty parlor, barber shop, a canteen for sundries, a clothing store, a shoe department, and a variety store with limited supplies. The community cooperative or Amache Cooperative Enterprise was developed and operated by the inmates who had purchased shares in the venture. The investors were provided rebates for their purchases. The cooperative was under the guidance of a group of directors who had been very successful owners of businesses prior to their incarceration in Amache. The Co-op was extremely profitable for all concerned. 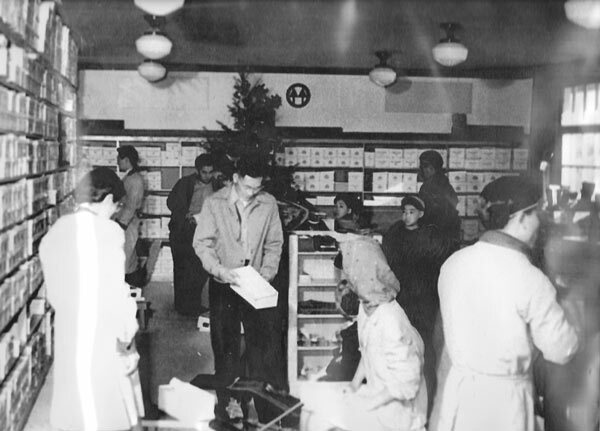 Even some non-Japanese persons from the Granada area shopped for goods and services in the camp enterprises. The Amache Post Office, a regular branch of the Lamar Post Office, handled 3,000 to 3,500 letters, and 400-500 packages each month.